Jean-Claude La Marre is an American writer, director, and film and television actor. 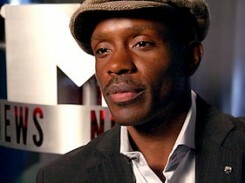 His film credits include Malcolm X, Dead presidents, Gang of Roses and Go For Broke. On television, he has guest-starred on New York Undercover, Law & Order, andNYPD Blue. La Marre's Color of the Cross, is a film that portrays Jesus Christ as a black man, and implies that Christ's persecution was a racially motivated hate crime. In 2007, LaMarre set up a distribution output deal for his film label, Nulite Media Group. Among the films released through the label are the revisionist western, Gang of Roses, Trapped: Haitian Nights, Broom Wedding, and Nora's Hair Salon, with a cameo byWhitney Houston in the film. LaMarre also directed David Carradine in his final American made film, Brothers in Arms for Sony.